Keep a colony of worms to turn your food waste into fertilizer! 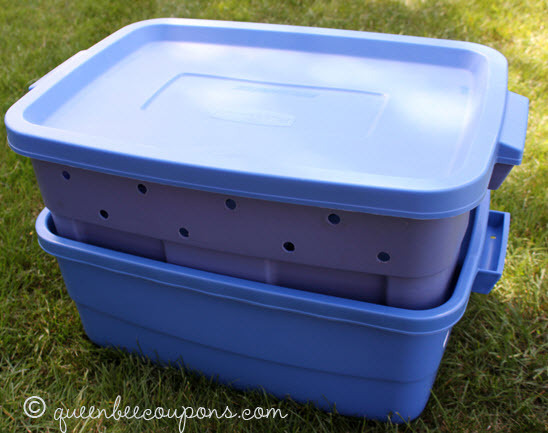 Get two plastic storage bins. Drill ventilation holes around the top of one bin and small drainage holes along the bottom of the same bin. Set some rocks in the second bin, then put the bin with holes inside the bin with rocks, ensuring that the rocks hold the bin up high enough for the ventilation holes to be exposed. Fill the inside bin with shredded newspaper, dirt, food scraps, and red worms. Sprinkle on some water, then lay a piece of wet brown paper and cardboard on top. Put the lid on the bin and set it in a cool, shady area of your yard. Add food scraps as needed, avoiding dairy, meats, and oils, and dump out the contents on a plastic sheet every few months to harvest the compost.